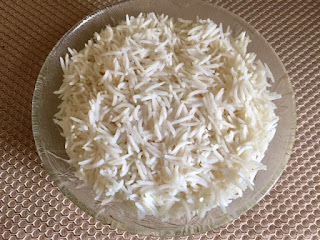 I had been wanting to make this recipe since a long time. 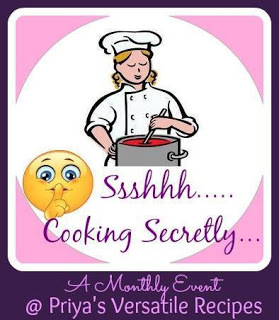 So glad this month in our group, Shhhh Cooking Secretly the theme is " Stuffed " and I got a chance to try out this dish. I am paired with Veena Krishna Kumar who blogs at Veena's Veg Nation Do visit her space and check out some delicious recipes. 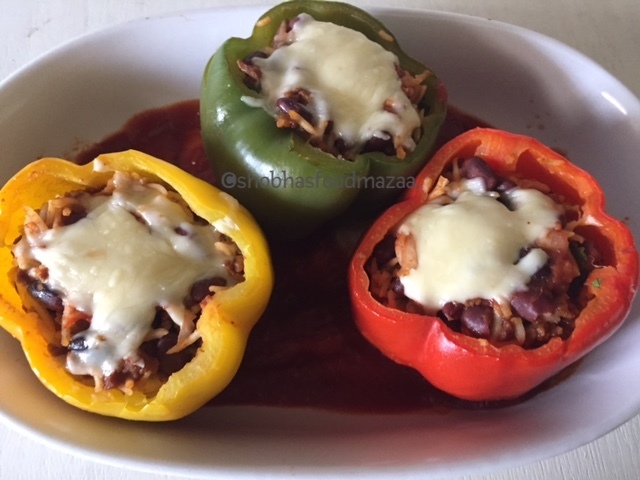 Veena gave me my 2 secret ingredients - Bell Peppers (Capsicums and Rajma) Usually the stuffed bell peppers are made with minced meat stuffing along with beans, rice etc. Since this is a vegetarian group I have used soya granules keema. For flavouring you can use any fresh herbs like coriander, parsley or basil. This is a complete meal by itself and so delicious. Make and enjoy the dish for lunch or dinner. Soak the kidney beans for 6-7 hours or overnight. Boil it in a pan or pressure cook it with little salt until done. Avoid making it mushy. Drain and set aside. You need - Oil, salt, spices like coriander powder, cumin powder and 1/2 cup sliced onions to cook the soya granules. Soak the soya mince granules for 1 hour. Heat 2 tbsps of oil in a pan and add the sliced onions. Saute to a golden brown colour. Add the salt, spice powders and 1/4 cup water. Simmer until the water is dried up. Mix together all the sauces mentioned in the list. Add a little salt for flavouring. 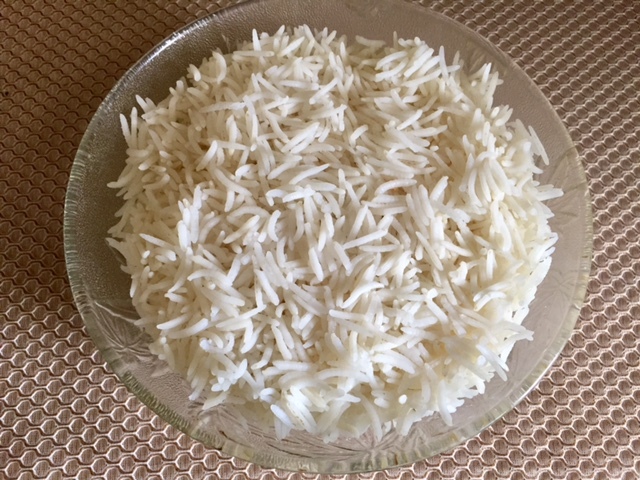 In a large bowl, mix together the cooked rice, rajma, soya mince, chopped onion and coriander leaves or any fresh herbs. Stir in a small portion of the prepared sauce to it. Keep the rest of it for later use while baking. Try to select the same size peppers. Wash them well. Cut out a thin layer at the top and remove the seeds and membranes carefully. Rinse them from inside. Remove them in a plate and spoon the mixture into them. Take a baking dish and pour the remaining sauce into it. Place the stuffed peppers on the sauce. Cover the dish with a foil and bake in a pre-heated oven for 10 to 12 minutes at 250 degrees C. Remove the foil and further bake for 5 more minutes. Finally top them with a little grated cheese and place them in the oven for a minute or until the cheese melts. Serve hot immediately from the oven. Tip: Select the bell peppers of the same size. If they don't stand straight you can cut a tiny portion at the bottom taking care not to make a hole. 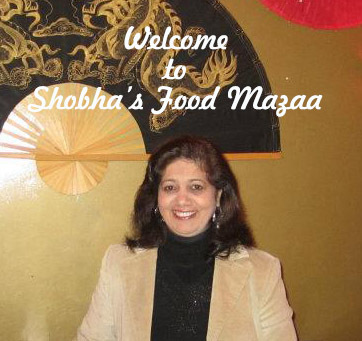 Super healthy and looks delicious..
A super healthy and filling dish Shobha. 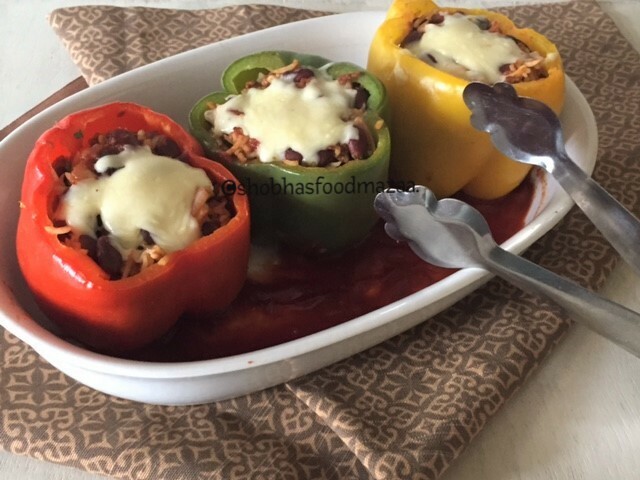 I love stuffed bell pepper but hubby is allergic to it,so don't get much of a chance to make them. 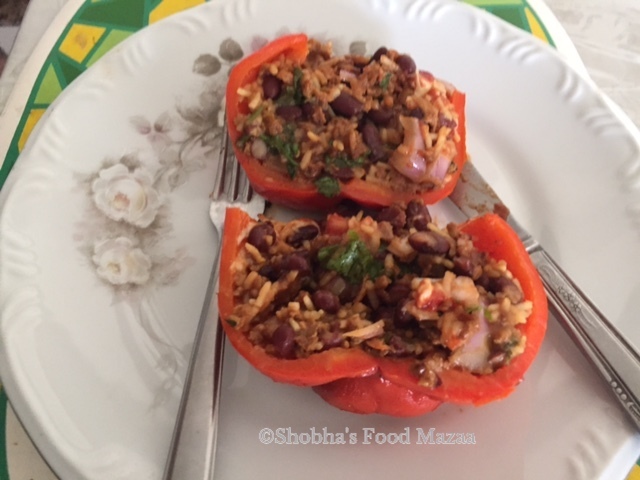 I love stuffing them with mushrooms,other veggies and paneer. Thanks Mayuri.. Yes they are really filling and make a complete meal. Vowww yummmyyy must try dish..looks colourfull n inviting. Thanks dear.. glad you liked it and trying out.